Welcome to Generation Number Three at Club Lago. 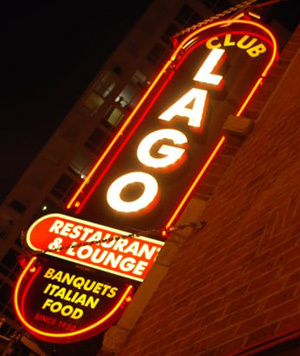 When Grandpa Gus opened Club Lago in 1952, his trademark was simplicity, an inviting but uncomplicated atmosphere, genuine but unpretentious food, and a straightfoward and uncluttered wine list. When our father, Francesco took over in 1980, he stayed true to Gus’s vision. We knew we wanted to continue in Grandpa’s and Dad’s tradition, but we also knew we wanted to make Club Lago’s wine list more exciting. And now we’ve done it! We have added more splashes of Italy, California, and elsewhere to give our customers a bigger world to choose from. We have also kept the simple but satisfying Italian table wines favored by Gus and Francesco. We have blended innovation and tradition. Whether you’re at the bar with friends on a lazy afternoon or looking to pair our great food with the perfect grape our new wine list will put a smile on your face.